Okay, so I find three thing to be especially awesome with this particular person of computer history. I’ll try to describe them as good as I can. 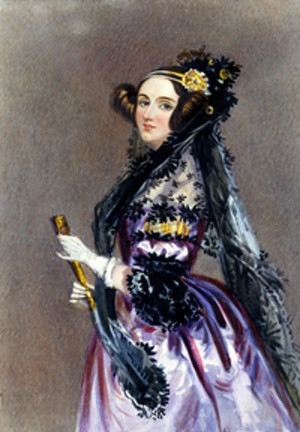 First – Ada Lovelace was a woman. Not a huge deal, but again it proves that programming not only is for men. Secondly – she lived in the 19th century, between 1815 and 1852. Not in the 20th century, not in the 90’s – much much earlier! Third – she wrote the worlds first computer program, ever. I mean, she came up with the idea, decided to make it on print and wrote everything by hand. This is really awesome, at least according to me. Lovelace wrote the first algorithm to be processed by Babbage’s mechanical computer. This was an analytic computer, as Babbage called it. Lovelace translated an article from the Italian mathematician Luigi Menabrea on the machine, and added some notes to it. This notes contained what was to become the first computer program, as we know it today. Basically, it was an algorithm encoded for processing by a machine. The Babbage machine was never built, but Lovelace still thought the machine would be useful to do more than just crunch some numbers and calculating values. Many people, including Babbage, only worked on the machine to calculate and nothing else. It you’ve heard the name Lovelace, but never heard it in the context of Ada Lovelace, it might be in the context of a computer program. The US department of defence actually named a software in Ada’s honor, and this became a bit famous as well. In short, Ada Lovelace is the one we have to thank for computer that does more than calculating. If it wasn’t for her and her work, you might not have been able to read this, and I might haven’t been able to write it. Unfortunately for Lovelace, she was not recognised for her work until almost 100 years after she passed away. Although, she now has a lot to be proud of, if she somehow would know about our world today.